iPhone Charger Cable for Car (3 ft), onepix [Apple MFi Certified] Coiled Lightning Cable for iPhone 5/6/7/8/6 Plus/7 Plus/8 Plus/X/SE, iPad Air/Pro/Mini, iPod Touch - Black by ONE PIX at Pacs BG. MPN: OPCC3FTB1PC. Hurry! Limited time offer. Offer valid only while supplies last. The best choice for your car Compatible Devices The onepix Lightning cable works with Apple devices that have a Lightning port, which including: 1. 3. iPod Touch 5th gen, 6th gen. The narrow Lightning port is small enough to fit most cases but strong enough to withstand repeated unplugging and storage. Normal size in 1.5 feet and can be stretched up to 3 feet. This cable DOESN'T support Apple Carplay. If it shows "Device Did Not Recognize Cable" when connecting to computer, it may because of the output current or voltage is lower than usual, please change another USB port and try again. 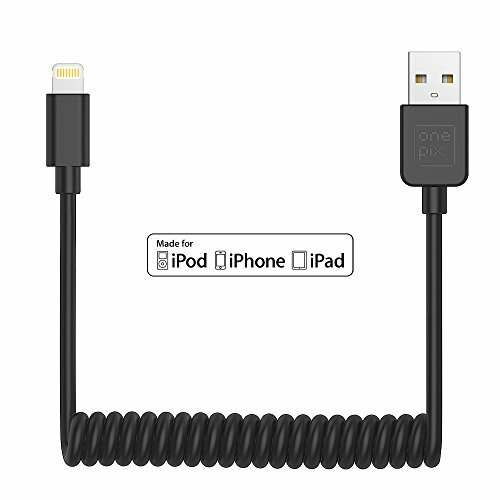 PERFECT IPHONE CABLE FOR YOUR CAR, say goodbye to clutter, you can stretch it to idea length when using car phone mount. ELASTIC COILED LIGHTNING CABLE, 1.5 feet in normal, can be stretched to 3 feet and bounce back to normal length well. APPLE MFI CERTIFIED CHARGER CABLE, meets all Apple's standards, make sure fast charge and sync, never show error message. Made for: iPhone X / 8 Plus / 8 / 7 Plus / 7 / SE / 6s Plus / 6s / 6 Plus / 6 / 5s / 5c / 5, iPad Pro 9.7" / Pro 12.9" / mini 4 / mini 3 / mini 2 / mini / Air 2 / Air / 4th generation, iPod touch 6th / 5th generation. 1-YEAR LIMITED WARRANTY provided by onepix. If you have any questions about this product by ONE PIX, contact us by completing and submitting the form below. If you are looking for a specif part number, please include it with your message.